Egilsstaðir is a town in east Iceland on the banks of the Lagarfljót river. 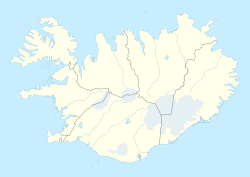 It is part of the municipality of Fljótsdalshérað, the county seat of Norður-Múlasýsla and the largest settlement of the Eastern Region with, as of 2016, a population of 2,306 inhabitants. Egilsstadir is located at 65°17′N 14°23′W﻿ / ﻿65.283°N 14.383°W﻿ / 65.283; -14.383Coordinates: 65°17′N 14°23′W﻿ / ﻿65.283°N 14.383°W﻿ / 65.283; -14.383. The town is young, even by Icelandic standards where urbanization is a fairly recent trend compared to mainland Europe. It was established in 1947 as an effort by the surrounding rural districts recognizing it had become a regional service centre. The town, which is named after Egilsstaðir farm, is near the bridge over Lagarfljót where all the main roads of the region meet, Route 1 as well as the main routes to the Eastern Region. Egilsstaðir has grown to become the largest town of East Iceland and its main service, transportation, and administration centre. The town has an airport, college, and a hospital. The town grew quickly during the economic boom in the region from 2004 to 2008 associated with the building of the Kárahnjúkar Hydropower Plant and Alcoa's aluminium smelting plant in Reyðarfjörður. The growth has slowed markedly since the banking collapse in 2008. In written accounts, Egilsstaðir is first mentioned in the 15th century as a place for legislative assembly. The nearby river Eyvindará is mentioned in the Saga of the Sons of Droplaug and Saga of the inhabitants of Fljótsdalur. 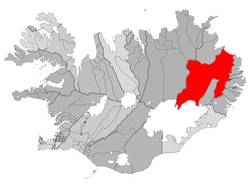 On June 7, 1998 Egilsstaðabær was united with Vallahreppur, Skriðdalshreppur, Eiðahreppur and Hjaltastaðarhreppur under the name Austur-Hérað. Austur-Hérað then became Fljótsdalshérað in the year 2004. Egilsstaðir has a subarctic climate (Köppen: Dfc). Winters here tend to be colder than other towns in the area, and summers tend to have daytime highs often exceeding 15 °C (59 °F), higher than most of Iceland, but at night it is colder than most towns with a similar climate. The figures here given for precipitation days and sunshine hours belong to Grímsárvirkjun and Hallormsstaður, which are 15 kilometres (9 mi) and 25 kilometres (16 mi) away from Egilsstaðir respectively and get around 100 millimetres (4 in) more precipitation than Egilsstaðir, so it is possible that Egilsstaðir has fewer days with precipitation and gets more sunlight than stated below. Although not stated in the table below, the highest temperature recorded is 29.2 °C (84.6 °F) on August 11, 2004, recorded at Egilsstaðir Airport. The climate has significantly warmed in recent years. Sveinn Birkir Björnsson - former editor of the Reykjavík Grapevine. Sigmar Vilhjálmsson - Iceland TV host. Hjálmar Jónsson - Iceland national team footballer. Vilhjálmur Einarsson, triple-jump athlete, silver medal winner at the 1956 Olympic games. Magnús Ver Magnússon, four times World's Strongest Man (1991, 1994, 1995 and 1996). ^ "Um sögu Egilsstaðabæjar" (in Icelandic). Retrieved 2011-05-30. ^ "Pöntunarfjelag Fljótsdalshéraðs" (in Icelandic). Retrieved 2011-05-30. ^ "Austur-Hérað" (in Icelandic). Retrieved 2011-05-30. ^ "Austri, 17. janúar 1903, 13. árg., 2. tbl" (in Icelandic). Archived from the original on 2011-07-26. Retrieved 2011-05-30. ^ "Hagstofa Íslands, mannfjöldi" (in Icelandic). Retrieved 2011-05-30. ^ "Hæsti hiti á Íslandi - Teigarhorn 22. júní 1939". Icelandic Meteorological Office. Retrieved 11 February 2017. ^ "Climatological Data for Egilsstaðir". Icelandic Meteorological Office. Retrieved 19 November 2016. ^ "Climatological Data for Hallormsstaður". Icelandic Meteorological Office. Retrieved 19 November 2016. ^ "1961-90 Precipitation Averages for Grímsárvirkjun". Icelandic Meteorological Office. Retrieved 19 November 2016. This page was last edited on 30 September 2018, at 21:31 (UTC).